Although the issue often eludes the political radar, in recent years Panama has experienced profound transformations in business, society and culture—transformations directly fueled by its youth. In the different strata, a new generation of entrepreneurs is increasingly causing disruption in traditional businesses. This same youth is also an advocate for social issues that, until very recently, were ignored (human rights, environment, LGBTI, corruption, etc.) and a protagonist for new forms of cultural expression that are gaining traction. It is a revolution that is better understood when we know that, according to the Comptroller General of the Republic, 52% (2.8 million people) of the total Panamanian population was born after 1989. And if we look at the figures of the Electoral Tribunal, almost 30% of people qualified to vote in the next elections are between 18 and 30 years old. This scenario will have a profound impact on the May presidential elections, not just because these people are young, but also because of their nature. They are trend-setters, they are media educated, they reject the concept of sales and they have a great capacity to redefine formal narratives. In addition, this young voter is naturally motivated by their present reality and their own perception of history. Therefore, traditional presidential campaign arguments (leaders and deeds of the past) will generate much less traction. Candidates will have to make a significant effort to genuinely incorporate, understand and reflect the ambitions and concerns of young Panamanians in their proposals. Whichever candidate achieves this will undoubtedly be able to persuade a large group of voters… and possibly win. In a recent LLORENTE & CUENCA Panama study on social media conversations, the hashtag #NoalaRelección (#NoToReElection) was above any other political topic, including messages from presidential candidates and political parties. This element of opinion, driven by groups and people who feel unrepresented by political parties, is the most innovative aspect of Panamanian political discussion in recent years. On the one hand, the movement made more visible the dissatisfaction of citizens towards the representatives of the Republic. Since in Panama all political authorities are elected in a single simultaneous vote, discontent used to be centered solely on the president or candidates for presidency. But after years of corruption scandals, lack of transparency and questionable practices by representatives, the spotlight has shifted towards them and consequently towards the presidential candidates of their parties. This scenario will pose a serious challenge to the credibility of political party candidates’ messages towards that section of the electorate. To gain the trust of those dissatisfied and disappointed with the current political system, they will have to be able to demonstrate with facts that they will not become part of the problem. Another important development in these elections will be independent presidential candidates. Although an independent presidential nomination was allowed as of the year 2014, it is now a feasible option in the minds of the Panamanian electorate. This takes on greater interest since, according to the Electoral Tribunal (TE), of the 2.7 million Panamanians eligible to vote, 1.4 million are independent, i.e., not affiliated to any party. This is the section of the electorate that traditionally tilts the balance in Panama toward a particular candidate. This brings forward some big questions and issues worth following up during the campaign: What impact will independent candidates have on the distribution of votes? Will they be able to capitalize on citizen discontent with political parties? What mobilization capacity will they have on Election Day? Will anyone be willing to negotiate alliances with parties? In 2017, a series of electoral norms was approved; their impact will be seen for the first time in the next elections. One of them is the limitation of private financing for presidential candidates to a total of $10 million. Another portion of the funding will come from the state. 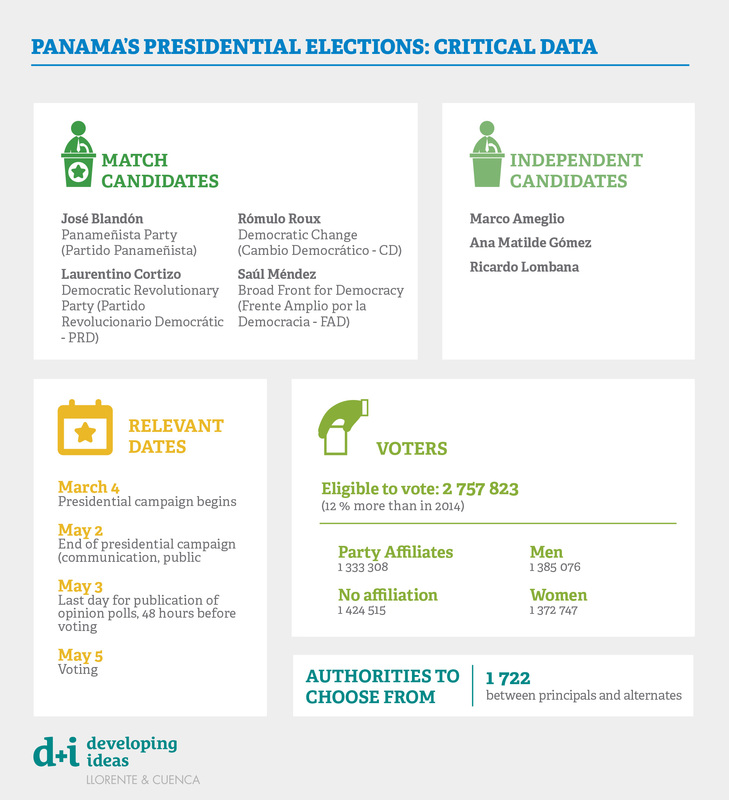 This will affect the volume of communication and mobilization of the different proposals (traditionally, in Panama, presidential campaigns spend several times more than the new limit). On the other hand, the publication of electoral polls has been strictly limited to a period of a month and a half, and it will not be possible to publish polls 20 days before the elections. In addition, electoral propaganda is restricted to two months. With less campaign time, these new rules primarily will benefit those candidates who have more brand recognition among the electorate. However, we live in a political and communication environment that is favorable to disruptive candidates. This will be the first Panamanian election in which social media and mobile messaging programs will have a profound impact on the mechanics of the presidential campaign (in 2014, we witnessed the beginning of this phenomenon, now we will observe its full impact). In fact, the country’s data and communications infrastructure suggest a very significant impact: Internet penetration exceeds 70%, with 2.9 million regular users. On the other hand, there are currently more than 7 million active mobile subscribers (almost two per person), from which 2.5 million have Internet access. As we can see, all the conditions are in place for information and communication technologies to have a significant impact on the presidential campaign. Who will win? Who will lose the virtual battle? He holds a Master's degree in public relations and strategic communications from Georgetown University, and is a communications strategist with 20 years of experience in public affairs, crisis management, storytelling, digital strategy, content creation and media relations. He served as a reporter and editor for the country's leading written media outlet, La Prensa. 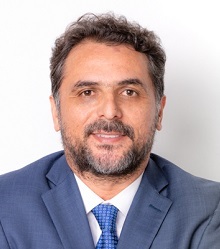 Subsequently, he directed a communications consulting firm until he joined the Panama Canal Authority as vice president of Communications, where he led the redesign and positioning of the brand and its identity among internal and external audiences. Prior to his incorporation, he was in the public sector where he worked as Secretary of Communication of the State. During his tenure, the President of the Republic thanked Dominguez for his dedication and professionalism at the head of the State Secretariat, especially during situations of exposure to national and international crises.